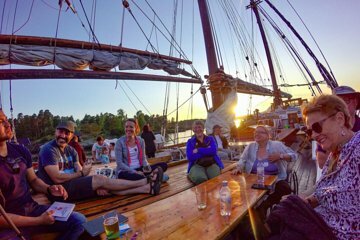 Tour the beautiful Oslo Fjord and discover Norwegian culture through its delicious food and drink. Walk the streets of Grønnland, taste local cured meats and craft beers, and enjoy a traditional Norwegian shrimp buffet as you cruise the Oslo Fjord. Learn about the history and culture of Oslo as you pass major landmarks. Great tour, we walk around some beautiful areas by the river. The beer tasting was a great experience and the lady provided a lot of information, she was great! We went also to taste some cheeses at the local market, delicious! Then we went to take the boat. The weather was great and we spent the rest of the evening on this sunset cruise with shrimp buffet along the fiords, looking at the different types of houses on the islands. This tour was a great way to do both things. Local sides and Oslo Fjord. You get what you pay for and my friend and I enjoyed that the tour went on a good calm way. The beer at the local bar was very good and unique. The lady at that place was very friendly and explained us each single taste. After having some beer, we went on a food-hall, there we got to buy some local cheese and that was a goos experience. By the end of the tour we ended up with the boat tour wich was aweome because the weather was just lovely. The food on the boat was a shrimp-buffet, it was very tasty and good although if you are allergic bring your own bread. Thanks to the guide who was very informative and helped us with any questions/doubts we had.